Since I've been posting a variety of nature and wildlife photos recently, perhaps it's time I offered a portrait. When I chose my business name, Classical Photography, twelve years ago, I wanted to stress the value of learning from the artists who have preceded us. Much as classical music has a richness born of hundreds of years of vibrant culture, but is constantly changing, I feel that all of the visual arts are built on what others have seen and created before us. Even when a great innovator seems to teach us to see in a new way, it doesn't come out of nowhere. 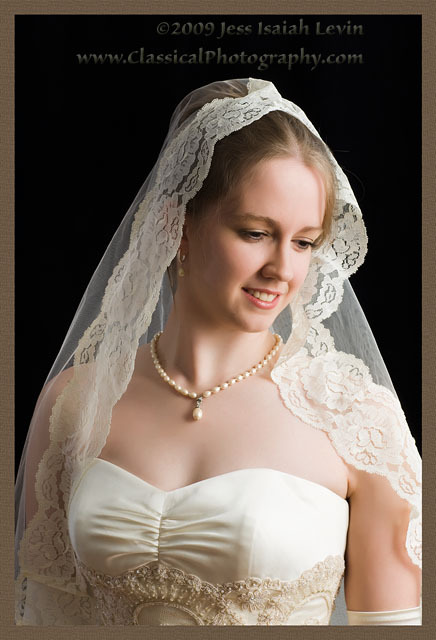 This lovely lady chose a wedding dress that by itself transports us to an earlier day. I have tried to do her justice by emulating the light and style we might see in a painting by a classical master. I have much to learn, but try to select the best people to imitate. Going on to create one's own new vision can only become easier - or at least more successful - after working through things in the manner that others before us have proven. On this day of the Presidential Inauguration, I have been feeling optimistic. As it happens, we in the NC Piedmont area also received our first snowfall of the year. My next post may be a landscape or two made possible by that event. Stay tuned!